Have the kids come home from school talking about Earth Day? Keep hearing about the green movement? Not sure what it is or if you're living in an eco-friendly way? Here are some changes you can make on a daily basis while going green. Because they spend more time there than most others, many people make more of an ecological footprint at home. This means that there are a lot of ways that your daily living patterns can harm the environment. To reduce this effect, you just have to be conscious of the causes of most ecological damage. Chemical run-off from lawns and driveways can end up in local streams or rivers. Try using organic lawn feeds or bug repellents to reduce this effect. If you wash your car at home, consider a natural soap alternative and wash it on your grass, to reduce the runoff into the street and drains. Teach your kids to turn off lights when they leave a room, to throw the recycling into the recycling can and to unplug electronics that aren't in use. Electric waste costs you and the environment. By teaching your kids now, you can be sure that your next generation knows a little more about conservation than you did! Composts bins and rain barrels are becoming staples in a lot of yards. Recycle your food waste and use the compost in your gardens and flower beds. Reuse the rain barrel water for plants and your yard. Remodeling? Try using paint that is free of VOC's (volatile organic compounds) and buy high-quality, used furniture from a reputable consignment shop. Retro is in, and the money you save on the furniture could be substantial. Not into used? The try to find furniture made from organic materials like hemp and wood that is Rainforest safe. Even in these virtual times, offices are paper hogs. 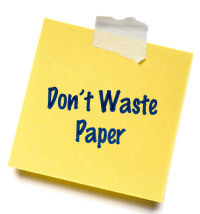 Cut down on paper wasted by reusing printer paper as fax sheets or note pads. See if your boss will allow you to telecommute a few days a week to cut down on those emissions and to help reduce traffic on the roads. If you must be in the office, then look for someone to carpool with. You'll not only save money on gas and reduce carbon emissions, but think of how you'll reduce your blood pressure not having to yell at the guy in front of you all the way to the office.